Cryorig and NZXT have collaborated to produce the "world's first software controlled RGB LED light heatsink". The H7 Quad Lumi takes the Cryorig H7 cooler as the base design and adds an additional 6 mm high-end copper heatpipe and a new QF120 Balanced LED fan. 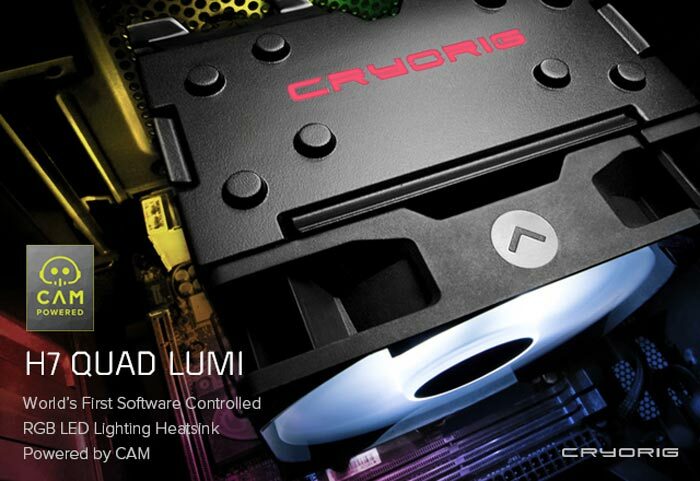 Of course the headlining aspect of this design are its lighting frills, so the H7 Quad Lumi builds-in the "game changing Lumi lighting system" which integrates an RGB LED controller which is programmable via NZXT's CAM software. Users can thus program the dual channel RGB lighting effects on the cooler logo and base via the CAM PC software and/or mobile app. 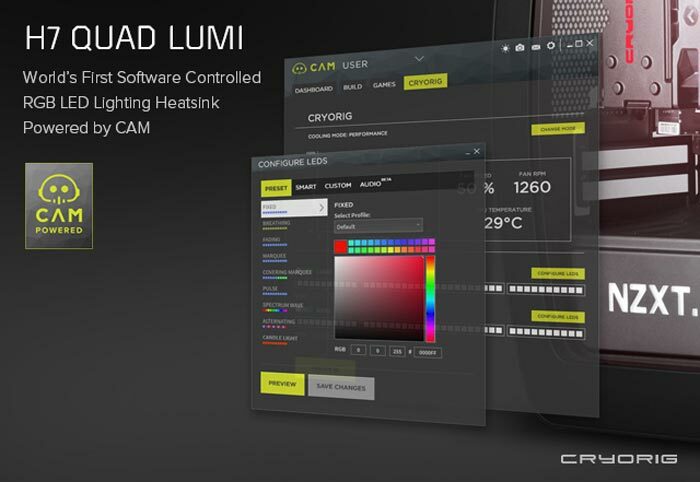 The Lumi lighting system employs NZXT’s Hue+ controller board, with nine different special lighting effects. If that's not enough for you, Cryorig says that the range of effects will be expanded upon in future firmware updates. Referring back to the dual channel RGB lighting effects mentioned above, all that means is that the RGB LEDs in the logo and base can be independently controlled. Remember that CAM isn't just for tweaking appearances via RGB colours, it also allows for fan control and profile settings. Beyond the NZXT provided RGB shenanigans, the H7 Quad Lumi is supposed to bring approx 10 per cent better cooling performance than the H7 upon which it is based due to the upgraded heatpipes and the new fan. The QF120 LED fan is a PWM controlled 300 to 1,600 RPM white LED backed device. It features built in Acoustic Absorbers, and a Quad Air Inlet system for added air throughput. Currently it is available with just white LEDs but further colour variants are in the pipeline. It is expected that the H7 Quad Lumi will become available by Xmas 2016, pricing will be revealed nearer to that time. As a guide, the regular Cryorig H7 costs about $35 online. don`t really know why it has taken so long for a product like this `“world's first software controlled RGB LED light heatsink”` to reach market. i had sound-to-light tubes in my computer over ten years ago. or have they pinned it on just one of those features being unique and justifying their claim based on that? (software controlled / led/ ) and so on. i would have thought that every sort of twinkly lights option had been exhausted by now (crucial ballistics tracer, msi motherboards, fans, psus etc etc).